Some materials luminesce, changing their color and intensity when under mechanical forces such as grinding or rubbing. These luminescent "mechanochromic" materials can produce various emission colors in the visible light spectrum, from blue to red. Their color-shifts under force are well documented, and are caused by changes to the molecules' crystal structures. Recently, a big shift from the visible spectrum to the infrared has been identified and described in the Journal of the American Chemical Society. Such a large change is unprecedented and is exciting because of its potential applications for bioimaging and invisible inks. In an attempt to develop new mechanochromic compounds, a research group at Hokkaido University in Japan found a gold compound called 9-anthryl gold(Ι) isocyanide complex has a unique feature. In its original form, the substance produced a visible blue fluorescence with a wavelength of 448 nanometres (nm). After being ground up into a fine powder, the substance produced infrared emissions (phospholescence) with a wavelength of 900 nm. The infrared emissions are invisible to the naked eye. "This is the first time a material has been reported to make such a dramatic shift - a change of 452 nm - that also reaches into the infrared part of the light spectrum," says Tomohiro Seki, the lead and corresponding author of the paper. The research group's X-ray crystallographic analyses revealed that the large shift is based on a crystalline-to-amorphous phase transition which should create strong intermolecular interactions between the gold ions. "The development of infrared emissive materials is generally difficult, and appropriate design strategies remain limited. 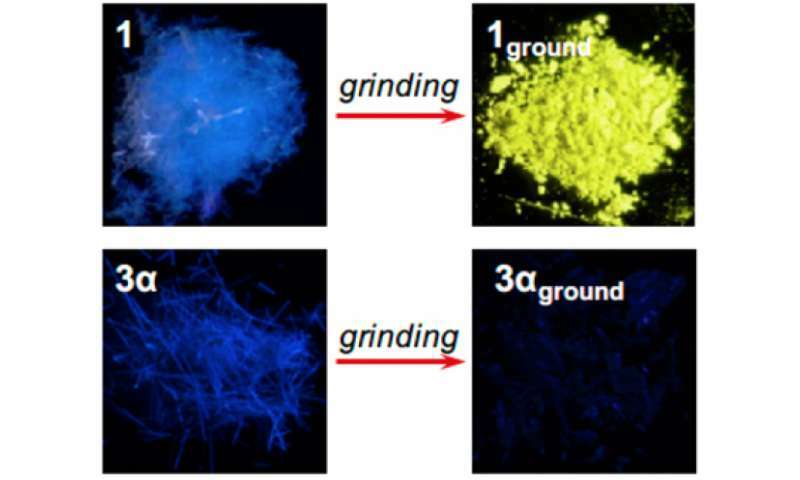 However, in this case, simple grinding can afford an infrared emissive material," says Hajime Ito, the corresponding author. "Infrared is invisible to the naked eye but detectable using a spectrometer. So, our material has a great potential for bioimaging and security inks."